Do you need a break from food you "can't live without" ? 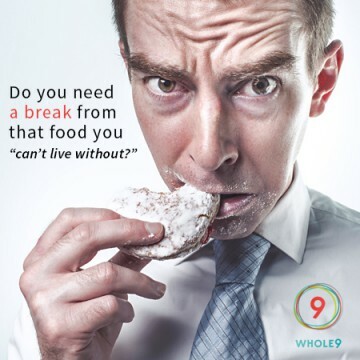 Welcome to Ask Whole9 Canada, where Summer Innanen and Sarah Ramsden answer all of your health and nutrition questions. In this week’s episode, Summer and Sarah talk about why you might need a break from that ‘food you cannot live without’. Is there one food that you cannot imagine living without? There are both psychological and physical reasons why we have an intense desire for certain foods. However, often the foods that we cannot imagine giving up, are the ones that we need to take a break from. How foods can contain chemical compounds that have an effect on your body making them more desirable. How a nutrient deficiency can lead you to crave a food. How your psychological relationship with that food can increase your desire for it. The connection between food intolerances, the adrenal glands and your desires for certain foods. Plus, how to determine if that food you cannot live without is problematic for you and whether you should try giving it up in your next Whole30. For me, it is dairy products. I lost twelve pounds during my first Whole30, and since I’d already eliminated grains and processed foods the year before, no dairy was the only significant change to my diet. I’ve been a cheese and cream person since earliest memory but it doesn’t take a genius the see that I should leave it out since it is the big common denominator in most of my binge triggers. I’m still figuring out what that looks like long term but I think another Whole 30 is in order. I also eliminated grains, sugars and processed foods almost a year prior to my first whole30… When I went grain and sugar free I was glad to still be able to enjoy dairy products and really thought it would be tough not eating them during my first whole30 however I only missed them on certain foods, like cheese on my hamburger or parmesan on my salad but other then that I really didnt miss it…food and alcohol are very social for me therefore choosing to not have a few drinks due to the sugar and grain content, leaves me with food to enjoy but when your eating clean without junk, carrot sticks arent quite cutting it when everyone around you are eating and drinking the things you cant! I have yet to find a happy medium…I say well I will have a few drinks but eat clean and then the chips and sweets come out and its all downhill from there! A second Whole30 is needed and soon! Sugar. I don’t think I’ll ever stop craving and loving it no matter how many whole30s I do. I use stevia now and avoid processed foods. I have built an “emotional save place” around chocolate which I really have to break. After a tough day at work I now workout to find relief. It´s not necessary to eat choc everyday. It´s just a bad habit I can break. Suza – it’s so good that you have noticed that connection and are looking for other ways to relieve the stress. Working out is fantastic for that. Quest Bars – I feel like I can’t live without them. I started with one a day and now I struggle not to eat more than 2!! I eat a balanced, clean and varied diet apart from these damn bars – I think because everything else I eat is so unprocessed these bars just taste SO good (they’re like crack!) I definitely need to go cold turkey and eliminate them from my diet to break this addiction from the ‘pleasure’ they bring me (or I THINK they bring me) when I scoff them down!